I wanted to be sure to end on an important note before I officially conclude writing about my experiences in Peru. Throughout the past two months, I spent a lot of my time working in El Porvenir—an impoverished city in northern Peru. This past March, Peru experienced an awful huaico, or flash flood, attributed to the phenomenon of El Niño. As I mentioned in posts throughout the past few months, we heard firsthand accounts from locals who live in El Porvenir and other cities in northern Peru about how the huaico affected their daily lives, and I spoke with various faculty members and school administrators about students whose participation in school has decreased due to having lost their homes in the flood. As I wrote about earlier, one student in particular was trapped underwater as the flood tore apart his home. Just days after this particular flood (because keep in mind, there are many), the Peruvian government stated that the death toll had reached 94, while estimates reported that 700,000 individuals were left homeless in 12 of the country’s 25 regions. Nearly six months later, there are still so many individuals affected by the flooding whose lives have been changed ever since. When driving into El Porvenir, one can spot the zona de las damnificadas (pictured below), or the area of the victims. In this designated area, temporary housing (tents) have been set up alongside the street for families who lost their homes in the flood. While living in a country filled with resources and opportunities for all (ideally), it can be easy to forget just how fortunate we are. I wanted to dedicate this post to those who have seemingly been forgotten, and to those who have been impacted by the devastating natural disaster that changed the lives of so many. From the children who cannot focus in school because they continuously re-live the scene of being trapped underwater to the parents who lost the homes they spent years saving up to afford, and everyone in between. This post won’t help any of the affected individuals currently living en la zona de las damnificadas. This post also won’t change the stigma associated with mental health in Latin America, and more specifically, Peru (which is another concern). This post won’t help individuals realize the importance of seeking out mental health care, and it won’t make any difference whatsoever in changing the way the public hospital systems work when caring for individuals without resources. This post won’t increase the number of resources in Peru regarding mental health care like there being 1 psychiatrist per every 300,000 people within the country. As I mentioned a few weeks ago, statistics show that nearly 5 million people (11.8%) in Peru suffer from some type of mental illness. 700,000 out of 1 million Peruvians suffer from depression, while 200,000 out of 1 million Peruvians suffer from some type of anxiety disorder. Less than 4 percent of these individuals receive services in specialized centers. Why, you may still ask? Fifty percent of such individuals believe they can overcome their mental illness on their own. Thirty percent don’t believe in treatment, and thirty percent don’t know where to go to receive services. So no, this post won’t help increase the number of individuals who receive services in specialized centers, and it most definitely will not decrease or eliminate the sense of shame that so many people associate with mental illness within the country. Realistically speaking, my words and my blog post can’t accomplish any of that. But what we can do is this: we can work together to appreciate what we have. As soon as we can learn to find gratitude and accept the term in its entirety, we can seek out ways to help those around us. There are so many people in need of help and assistance everywhere you turn, but when we become engulfed in our own lives, we often turn a blind eye to situations around us, and understandably so. But if we don’t help those in need, who will? It has to start with us. As for finding a solution to problems throughout the world, well, I haven’t gotten that far yet, and frankly, I doubt that I ever will. But if we can each find a way to work together and use the resources at our disposal to try and make the slightest difference—whether in somebody else’s life, in the community, in a different country, or on a global scale, that slight difference will hopefully make a lasting impact that will better the lives of those in need. Yes, I understand that this is much easier said than done, and it’s just a bunch of words written on a page that probably won’t be read by many. But we have to start somewhere with something. And I guess this is that starting point. As I conclude writing about my experiences in Peru and the incredible opportunity that I have been given, I kindly ask that we work together to not forget those who have seemingly been forgotten. Mother Teresa once said, “Not all of us can do great things. But we can do small things with great love.” If you ask me, I think that’s the perfect starting point for all of us. On Friday morning, we hosted another workshop with a different group of Líderes Escolares. Similar to what I mentioned in yesterday’s post, today’s workshop focused on mental health, including psychoeducation regarding the difference between sadness and depression, the difference between stress and anxiety, how to spot signs of suicidality, and resources that the students can use in the case that a peer is experiencing any of the aforementioned topics. The students who participated in today’s workshop were younger than most of the other students we worked with thus far, but their interest and participation in such serious topics was great to see. Following the workshop, one of the students stood up and thanked us for the work we have been doing in Peru, and for the information and support we have provided the Líderes Escolares with. You can never know if you are making a difference in the surrounding community, and even though we still don’t know whether or not we have been and are making a difference, it was truly rewarding to hear such young students thanking us for working with them. After working with such inspiring, young leaders, one can’t help but feel a great sense of hope for the future. After our workshop, some of the social workers we have been working with took us out for a delicious lunch, consisting of ceviche mixto and chicharron de pescado. As soon as we finished lunch, I had to get back to Huanchaco for my last Spanish grammar class. Once our class ended, another student and I ran over to facilitate our last group with adolescent males that I spoke about throughout the past few weeks. Today’s group focused on support systems and evaluating the different types of support we each have in our lives (including practical support, social support, emotional support, and advice-based support). This activity helps you realize the types of support you may or may not have, which is useful in thinking about who one’s main confidants may be. We then focused on TIPP, which I wrote about on Monday. During times of crises, TIPP is a useful tool that one can utilize to take a step back from the crisis to de-escalate the situation. TIPP can be used when one is about to engage in dangerous behaviors during a crisis, when an individual needs to make an important decision, but is too overwhelmed to think/make a decision, the individual is not processing information effectively, the individual is emotionally overwhelmed, and/or the individual isn’t able to use his/her abilities. TIPP stands for Temperature, Intense Exercise, Paced Breathing, and Paired Muscle Relaxation—all of which are techniques one can utilize during a time of crisis. As we finished the session, we celebrated our time together and the group members’ participation throughout the past few weeks with a chocolate cake. 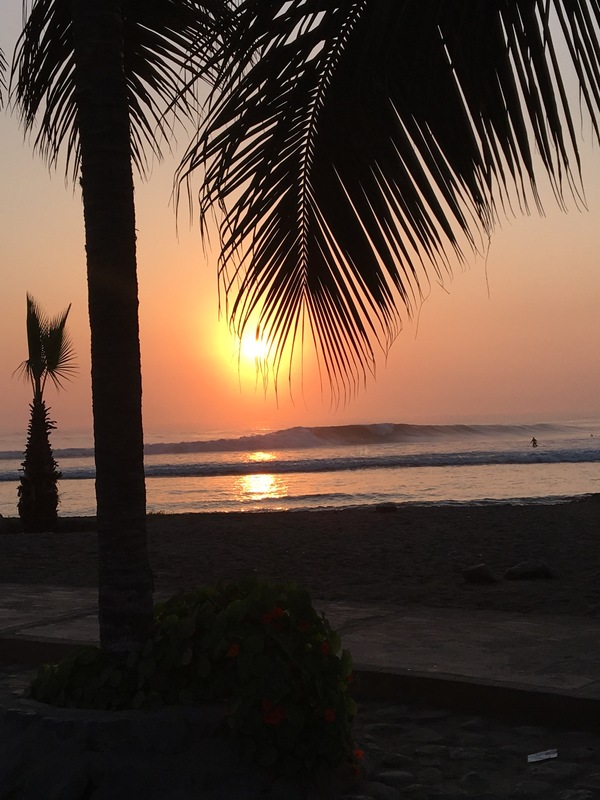 Following the group, we ran over to the beach to watch the sunset one last time, before having to leave Huanchaco later that evening. After enjoying the sunset, some of the other students and I went for dinner, and returned back to our house to pack, before leaving for the airport. Since I won’t be returning to the States until Tuesday, I took a cab to San Isidro (where I will be staying for the next few days) once I arrived in Lima at around midnight. On Thursday afternoon, we had our second workshop with Líderes Escolares from three different schools. Today’s workshop focused on mental health, including psychoeducation regarding the difference between sadness and depression, the difference between stress and anxiety, how to spot signs of suicidality, and resources that the students can use in the case that a peer is experiencing any of the aforementioned topics. It was truly incredible to see so many adolescents participate in todays workshop, especially given the intensity of the topics we discussed. Many of the adolescents mentioned knowing someone with a mental illness and/or knowing someone who has contemplated or attempted suicide. As I mentioned before, seeing so many young individuals take the initiative to learn about mental health in general and ways to help others as leaders in their schools has been, and continues to be refreshing and inspiring. Following the workshop, we made sure to enjoy the sunset once again, before having a Cena Familiar at a local pizza restaurant with everyone from the program, seeing as it was my last night in the program, as well as the last night of a few other students as well. On our way back to the house, we stopped for picarones (the delicious fried dessert that one could only dream of.) After dinner, we played cards to officially end our last night in Huanchaco. On Tuesday, our workshop with one of the groups of Líderes Escolares was cancelled, due to a huelga (strike) on behalf of teachers from various schools in Trujillo. Simply enough, the day was spent catching up on homework and preparing for two other workshops scheduled for later this week (which included procrastinating and going for a walk outside), followed by an adventurous dinner with some of the other students. And of course, since it’s my last week, I made sure to take in the sunset once again. We began Wednesday morning with our Spanish for the Mental Health Setting class. After class, I had my final evaluations and supervision for the program, which consisted of an oral proficiency exam as well as reading a sample case study and deciding how I would work with the client and provide psychoeducation regarding TEPT (trastorno de estrés postraumático, or PTSD in English), as well as psychoeducation and techniques for relaxation. After the evaluation and supervision, we went out for a light dinner and spent the evening listening to music at a bar by the beach, and then sitting by the beach, as we took in the beautiful sights of the city. This morning (Monday) began with our Terapia Conductual Dialéctica course, which focused on Distress Tolerance, TIPP, and Emotional Regulation. During times of crises, TIPP is a useful tool that one can utilize to take a step back from the crisis to de-escalate the situation. TIPP can be used when one is about to engage in dangerous behaviors during a crisis, when an individual needs to make an important decision, but is too overwhelmed to think/make a decision, the individual is not processing information effectively, the individual is emotionally overwhelmed, and/or the individual isn’t able to use his/her abilities. TIPP stands for Temperature, Intense Exercise, Paced Breathing, and Paired Muscle Relaxation. With regards to temperature, the individual can put cold water or a bag of ice on his or her face, while bending over and maintaining respiration (holding his/her breath). The individual can also put his/her face in a bowl of cold water for 30-60 seconds, or put an icepack on his/her face while bending over, and maintaining respiration (holding his/her breath). This action helps reduce emotional and physiological arousal. The action of Temperature can also be used when the individual isn’t able to sleep due to anxiety and/or while experiencing dissociation during therapy. According to mindfulnessmuse.com, “In order to get ourselves to a place of being capable of processing information, we must find a way to essentially ‘reset’ the nervous system. Fortunately, all mammals have something called the ‘mammalian diving reflex’ that forces the parasympathetic nervous system to kick in, which functions to relax us and calm us down. In regards to Itense Exercise, doing some form of intense exercise for 30-60 seconds can change one’s mood and lessen one’s negative mood, and increase positive affect. This can include running in place, jumping jacks, and/or running up/down a flight of stairs. Our emotions have the ability and tendency to make us ready for action (as in flight or flight), so an intense exercise can make regulate our body to a less emotional status. Paced Breathing refers to inhaling and exhaling slowly (five or six breaths each minute with a four second inhalation and eight second exhalation). Paced breathing—in addition to the other actions can help us lower our level of emotional arousal and make the switch from utilizing our sympathetic nervous system (which is ready for flight or flight) to our parasympathetic nervous system (our more relaxed state). Finally, with Paired Muscle Relaxation, the strategy is to tighten your muscles, noting the sensation of tension in your muscles (and you can work on specific muscle groups, one at a time). As you loosen your muscles, you can say the work “relax” aloud, noting the sensation of how your muscles feel. The goal with Paired Muscle Relaxation is to increase one’s awareness of tension and relaxation, and functions as one of the various abilities to overcome a crisis. While these abilities, or strategies are meant to help during a moment of crisis, they are not by any means a solution to one’s crisis. These abilities/strategies should be paired with other strategies (i.e. confiding in somebody immediately after or seeking help by a professional). When working with emotional regulation, one of the actions is to act in a manner contrary to the emotion that is currently affecting your behavior. First, you must identify the actions that are affected by your emotions, do the opposite action, and do so completely and fully, without holding back. Simply stated, you’ll want to do the opposite action of what you’re feeling (i.e. if you’re feeling lonely and went to isolate yourself, you would instead spend time surrounded by others). Instead of surprising what we’re feeling, we would simply use our emotions to guide opposite behaviors in order to make a change in how we’re feeling. After class, we had our weekly meeting with a group of local women and family members in El Porvenir that I spoke about in prior posts. Each week, two students from the program are responsible for teaching the group members relaxation and emotional regulation techniques for them to utilize at any given moment and teach others in their community. This week’s topic focused on the difference between sadness and depression, as well as the importance of self-care—something that so many of us forget to do on a daily basis. Imagine that you have a bottle of water and give a little bit to each person around you. There would be nothing left for you once you get thirsty. We can’t care for others if we can’t care for ourselves first. We tend to find ourselves telling those around us to care for themselves, but it shouldn’t be any different for us. It is just as important for us to follow the acronym CUIDARSE, and do exactly as it says—take care of ourselves. Following the group, some of the other students and I went out for dinner, and made sure to enjoy the sunset during our last week here. Saturday was spent catching up on homework and getting a head start on projects due this upcoming week since Friday will be my last day in the program. In the evening, we had our Spanish for the Mental Health Setting class. After class, some of the other students and I went to dinner, before getting ready to go out in the city for our last official weekend in town. 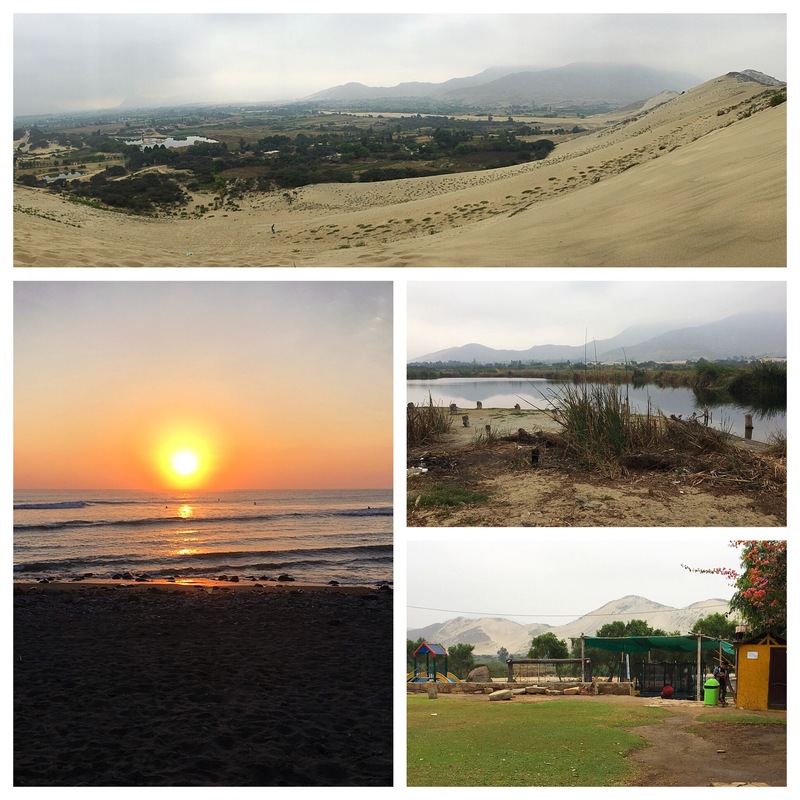 On Sunday morning, a van picked us up at 7:30am and took us to La Laguna de Conache, located near Trujillo for some sandboarding. If you can imagine snowboarding down a mountain with snow, sandboarding is almost the same, except on a mountain with sand. Sandboarding was truly a blast- even if we left the house at 7:30am after returning from a night out at nearly 4:00am. After having spent a few hours riding down the sand, we returned to Huanchaco for lunch, and walked around the local artisan market. We spent the rest of the day taking it easy, and made sure to sit by the beach to enjoy the beautiful sunset before going out for dinner and returning home to finish our homework.